Judo: Seven Steps to Black Belt: An Introductory Guide for Beginners is a non-fiction sports education book written by Rodolfo Tello. The author is a Certified National Judo Coach as well as a black belt, and he’s been a practitioner for over twenty years. He introduces the history of judo, in particular, and martial arts, in general, which began in ancient Japan. Jujitsu, which is considered a forerunner of judo, was practiced by samurai. While originally martial arts were practiced for use in actual combat, in the nineteenth century, martial arts began to be introduced as a sport and for self-defense. Jigaro Kano developed judo as a martial art that would use efficiency in the application of mental and physical energy to subdue an opponent. Tello describes the fundamentals of judo, including the forms of etiquette involved in the sport, the uniform, and what to expect in a judo class. He discusses the four major types of judo techniques and how one can improve their performance in this martial art through conditioning, mental preparedness, competitions, and the practice of kata. Finally, he describes the seven steps of advancement and the challenges a judo student faces at each step. Tello provides an extensive set of appendices which include a glossary of terms, references, and a list of recommended readings. I've long been interested in learning a martial art, so Rodolfo Tello's non-fiction work, Judo: Seven Steps to Black Belt: An Introductory Guide for Beginners, seemed the perfect place to learn about judo, and it was. This book gives the reader an historical and philosophical perspective as well as an introduction to the physical mechanics of judo, which in retrospect seems an essential approach. Tello demystifies what goes on in a class, and I found myself more and more drawn into the idea of exploring this martial art more fully. While there are not many illustrations, Tello provides plenty of links for videos, which he explains will be a lot more useful than static photos, and they were. Rodolfo Tello's coverage of his subject is enthusiastic, knowledgeable, and well-presented, and I recommend Judo: Seven Steps to Black Belt: An Introductory Guide for Beginners most highly. Judo: Seven Steps to Black Belt by Rodolfo Tello is an instruction book on the steps needed to attain the coveted black belt in the martial art of Judo. Judo is one of the most powerful of all the martial arts, featuring moves that are not seen in any other sport. Judo is the one art that, practiced properly, can bring an opponent successfully to their knees, effectively and efficiently. That power could be yours. The proper training takes safety into account and provides for a complete fitness activity and all the opportunity you need for constant improvement and advancement. Judo is not just a martial art; it is a way of life, a form of protection and a chance to develop true skills in leadership. Judo improves self-confidence and self-esteem and builds up life skills. Judo is now an Olympic sport and Rodolfo Tello is here to instruct you on how to reach the heady heights of the black belt. Judo: Seven Steps to Black Belt by Rodolfo Tello is a concise and highly instructional book. It is written in easy to understand language, using terms that are fully explained along the way. Each different move is laid out in a way that anyone can understand and follow the principles behind it. I used to do judo in my younger days and it brought back memories of some very enjoyable competitions, although I didn’t advance quite that far. The only complaint I have is that I felt there could be more illustrations. I know from personal experience how much easier it is to understand some of the judo moves when you can see how they are done. Apart from that, I enjoyed reading the book and learnt quite a bit from it. Judo: Seven Steps to Black Belt is a step-by-step guide for beginners. Written by Rodolfo Tello - Black Belt and Certified National Judo Coach – the guide is designed for readers of all ages who are contemplating a future in martial arts. Judo is a Japanese style of fighting, with strict rules, etiquette and discipline. Rodolfo Tello explains these very basics, complete with photographic illustrations, but also provides a disclaimer, recommending that the book not be used on its own and that the student seek out active classes in which to participate. It briefly discusses the history of different Japanese fighting styles, starting with Jujitsu, but as martial arts moved from a kill-to-win idealism to one where you maim (rather than kill) your attacker, fight for sport and learn inner peace while instilling self-discipline, different new fighting styles soon emerged. Now an Olympic sport, Judo has become a popular style of fighting worldwide, with students having to learn not only the physical aspects, but also the fundamental, spiritual, linguistic and historical parts which form the whole package. Different throws, grips, sweeps and other defensive fighting techniques in Judo are described in full detail, as you graduate from one belt to the next until you reach the highest level. A glossary is also provided at the end of the book for easy reference to the Japanese terms used in Judo and their English counterparts. As a former Judoka, I was extremely excited to read this book for the purpose of review. It took me back to my youth as a martial arts student, even bringing recall to the ever-scary first day when you learn how to fall correctly. Judo – Seven Steps to Black Belt is so beautifully presented, with the instructions, illustrations and Japanese language translations for moves, thus making the journey from White to Black so much easier. 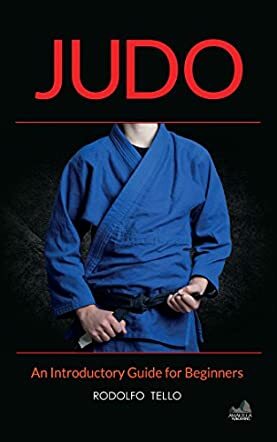 For any student who is serious about moving forward in the Japanese martial art of Judo, this book would be the perfect addition to their home library, as Rodolfo Tello explains how to succeed in this easy-to-follow guide for all ages. Judo can be an intimidating sport, too often discouraging to beginners and prospective practitioners. Rodolfo Tello's Judo: Seven Steps to Black Belt, however, simplifies and makes judo approachable. Tello outlines the fundamentals of judo, basic judo techniques, how to improve performance, and details the seven steps to a black belt. Throughout the text, he guides with an evident sense of enthusiasm that infects the reader and encourages a similar zeal towards their studies of judo. This guidebook is essential to those who have recently discovered the sport and desire to learn more, as well as those looking for a refresher course. Indeed, one could say that Tello's Judo should be an integral addition to every judo practitioner's collection. In that case, further and more in-depth lessons on the subject from the author in the future would be ideal. For now that he has started his reader on this journey, it seems only fitting that he should continue to direct them on this most exciting path. Rodolfo Tello's Judo: Seven Steps to Black Belt is an informative text, replete with the basic knowledge one needs to get started in judo. On occasion, the book contains an illustration depicting a particular technique, while also providing several useful resources that one can consult to further one's education in judo. These sources extend beyond the textual to real-life experiences, such as visiting the Kodokan Judo Institution in Tokyo, Japan. In all, as a primer, Tello's Judo serves as a motivational guide, so that one's experience in the art of judo is an empowering one. Judo: Seven Steps to Black Belt (An Introductory Guide for Beginners) by Rodolfo Tello comprises a long introduction. It explains the origins of Judo and its development as a sport governed by the International Judo Federation, which has culminated in its adoption as an Olympic event. Divided into four titled chapters, each extensively subdivided, it is designed to guide anyone interested in how to undertake the necessary training, helpful advice as to the level of fitness required to do so, and the aims to which a judokas (a person taking part in Judo) should aspire. It contains a comprehensive glossary of Judo terms and ends with an impressive list of references. Rodolfo Tello provides a great deal of information in his relatively short, beautifully illustrated book, Judo: Seven Steps to Black Belt (An Introductory Guide for Beginners). The comprehensive introduction is interesting and gives a clear picture of the subjects covered. The history of Judo, developed as it was from war skills into a sport targeted at self-control, consideration and care for the safety of others, and mental confidence, is fascinating. It truly is a book for beginners, and even more perhaps for those considering taking up Judo. Mr Tello goes into detail about the level of fitness required to undertake the sport safely, and how to achieve it. He is also extremely practical, even down to the best method of laundering the judogi (the garment worn by judokas). I learned a lot from this book and I recommend it to anyone who enjoys sport, perhaps even more to parents looking for a way to guide youngsters to a physical activity which, while competitive, is firmly based in consideration for others and good manners.